There are many different rabbit breeds and types. Research shows well over 50 different breeds with varieties of each particular breed. They come in different sizes, colours and shapes. Different rabbit breeds, and varying sizes, can have different requirements. We have devoted separate pages below, for each popular breed of rabbit, plus the not so well known breeds that you might be interested in. Click on the links below to find the necessary information. If you are looking to buy a rabbit then you need to decide whether you want a dwarf , small, medium, large or very large (giant) rabbit. 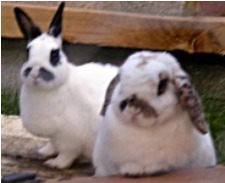 There are the mini variety, a small breed, selectively bred such as the mini lop, the mini rex or mini lionhead etc. Depending on the breed, there can sometimes be confusion between a dwarf and a mini. Dwarf does not necessarily mean the smallest breed when fully grown. More specific fully grown sizes and weights can be found on the particular page for each rabbit type. Different breeds or types can be more suitable to what you are looking for. For example, some breeds are more suitable to be kept as a house pet, whilst others may better as a child's pet. Temperament or suitability is not dependant on the size of the rabbit. Markings and colours will vary from one breed to another with perhaps the Dutch Rabbit being one of the most distinctive. Rabbits have different characters and temperaments. This can be dependent on types of breed but even within each breed. Each rabbit has its own character and temperament. Nothing is written in stone. Rabbit breeds are sometimes unclear. Do you know the breed of your rabbit ? TIP: Since most people scan Web pages, include your best comments or thoughts in your first paragraph. To add pictures (.jpg) or graphics (.gif). Click the button and find the first one on your computer. Select it and click on the button to choose it. Hi, Me and my partner would like to know if anyone can decide what breed rabbit our little rabbit is?? Thanks! What breed is my Thumper? Does anyone know the breed of my rabbit? What kind of rabbit do I have?? Needing help determining his breed! Hello I rescued this little sweetheart, and I have mini Rex bunnies, but I'm not quite sure what he is. Please help anyone! New bunny but unsure of his breed. Hi I do not know the breed, I believe it is a holland lop but not sure. Please help. How Do I Know If My Bunny Is a Standard? Do you have any idea of the breed of my two rabbits? I found a bunny but what breed is it? Please help. Thank you. Please help identify this oldie! What breed is my rabbit? Please help! Can anyone help us identify the breeds of these two rabbits? breed identification help on this pair of rabbits needed please. I don't know what breed my rabbit is? Hi Buddy and chip both males around 4 years old. I got them online as rescue rabbits and I am not sure what breed they are. Any help please? Please Help Me Determine The Breed Of My Rabbit! Hi We got Taz two days ago from the pet store, would anyone know what breed he is please, I suspect about 8 weeks old. what breed of Rabbit is this? please help me identify what kind of rabbit Gizmo is! Hello This is Finnie. She's 15 weeks old. Does anyone know what breed/s she could be please? The Breed of My Rabbit? New baby rabbits and not sure what breed. Can anyone tell my rabbit's breed? Definitely a lop- but which breed? Help! I would really like to know what breed my rabbit is please! Can anyone identify what breed of rabbit I have? I would love to know what breed my baby rabbit is , help please ! What breed is my baby?! Can anybody help with the breed of my rabbit? I just got a baby female bunny rabbit. Can anyone tell me the breed? What breed is my bunny rabbit? Help, we don't know what breed of rabbit we have, can anyone suggest what they think our rabbits might be please? What breed are our rabbits? What breed is my bunny, Cotton?? Ellie-What is her breed and why is she attacking?? I have no idea what breed these rabbits are. Hello , I have these two rabbits and I only know they are about two years old. I have no idea what breed they are. Can anyone help please? can't work out her breed! Hi The lady who gave us this rabbit is a breeder and when she gave it to us, she said that is a dwarf, but i'm not sure!! can you help me? This is my rabbit,Stefani, I don't know what breed she is though? Does anyone have any ideas please?